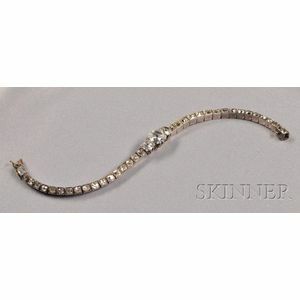 Antique Diamond Bracelet, prong-set with an old mine-cut diamond weighing approx. 1.00 cts., flanked by old mine-cut diamonds each weighing approx. 0.50 cts., and completed by a bracelet of box-set old mine-cut diamond links, approx. total wt. 5.50 cts., silver and gold mount, lg. 6 1/8 in.